A variety of options are available depending on the skin lesion. These include some combination of shaving, liquid nitrogen freezing, chemical peel and laser. Age spots which are pools of pigment cells that gather in groups in response to aging and sun exposure responds well to laser or chemical peel. Benign moles respond to laser or freezing. 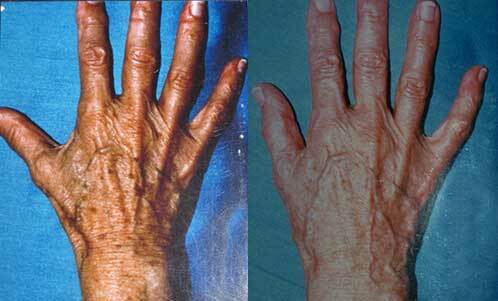 Before and after a single laser treatment for age spots on the back of the hand.